Did DASH 9 leave you wanting more? The sidebar says it all; Ex Exit Games is a web site about Puzzle hunts, puzzle games, escape rooms and more, and it works out to be roughly in that order. It’s all pretty seasonal; many of the hunts take place once a year at similar times, and so do many of the puzzle competitions, so that’s when the posts most naturally tend to happen. Happily these days there are many excellent blogs that will tell you all the latest news and reviews about escape rooms, so I don’t feel bad about downplaying that aspect of things. The most distinctive and unusual sort of game coming up is probably Defenders of the Triforce put on by SCRAP’s Real Escape Game brand in mid-July. “This is not an escape room, it is more than that. Solve puzzles together with other teams, in a huge area, all within a set time limit. Interact with classic items and characters seen in The Legend of Zelda series like the Goron, Zora and Kokiri tribes.” I get the impression that it’ll be somewhere between a puzzle hunt and a night at Puzzled Pint. The game is on a tour of North America and Europe, and North American reviews suggest this is as good a SCRAP game as there ahs yet been, though that’s not quite as ringing an endorsement as it might sound. My post on the game has links to these reviews. A Door In A Wall have just started their latest public murder mystery game, Horses for Corpses, on Friday and it will be running for (at least) just over a month. Turn up at your assigned time at a location in Camden Market, with at least one smartphone per team; you then “have 2 hours and 40 minutes to explore the area and gather evidence: solving puzzles, interacting with characters and collecting clues“, before returning to make your accusation as to who the killer was. In some ways, this is as close to another DASH as you’ll get, dialing the story strongly up and the puzzles slightly down, and it may be closer to the canonical puzzle hunt experience than DASH actually can be. Ken from The Logic Escapes Me swears by them, and sometimes at them. Fire Hazard‘s stock in trade is High-Energy Immersive Games; top of their list is the five games they are running in July of their new design, Evasion, which asks “Can you search a room without leaving a trace? Can you defuse an explosive situation? Can you impersonate an enemy agent without blowing your cover? ((…)) You’ll race against the clock completing special missions, cracking cryptic messages, and keeping your cool while the enemy is in hot pursuit” and promises “added escape-room style puzzle-solving tasks“. Take a look at this interview for further details. Other than that, they still offer the high-speed City Dash in various locations around London (and, this Saturday, in Odense), and the low-speed Raiders of the Lost Archive that walks all around the Victoria and Albert Museum. There’s also a pop-up second Raiders game, Raiders: the Sunken Tea Set, that takes place on other levels of the museum – so if you enjoyed the original then a rare second helping may be on offer! I don’t thiiiink our friends at Treasure Hunts In London have anything lined up, but checking the meetup groups, there’s plenty going on elsewhere. 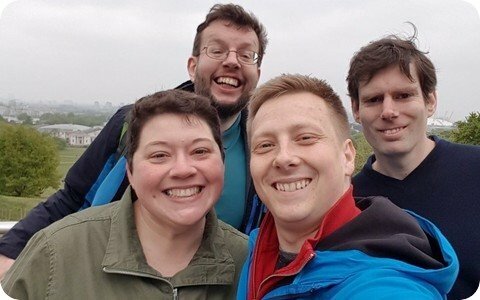 The Cultural Treasure Hunt Meetup group are hosting a hunt around the Fitzwilliam Museum in Cambridge on May 20th, and another one around the National Maritime Museum and Historic Greenwich on July 29th. The latter of these might seem a little ironic considering that’s where we were for DASH, but I get the impression that there may be less crossover between the two than you might expect. ((Edited to add:)) Rich Bragg from ClueKeeper points out that there are self-guided hunts available using the ClueKeeper platform, and some of these are based in London! 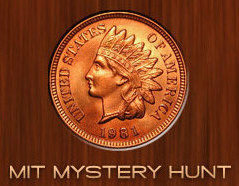 Treasure Hunts in London have hunts in Chingford, in Brixton and around Spitalfields, and Urban Hunts have hunts around the City of London and in the Museum of London. Perhaps the puzzles will be easier than DASH, but this is by far the most authentic way to get some of the DASH experience whenever you want some. Further North, all are welcome at The Armchair Treasure Hunt Club‘s Spring one-day hunt in Hebden Bridge, also on May 20th, and the Manchester Puzzle Hunts Meetup have a report from their first event, with the implication that there should be a second event in about a month’s time; follow the Meetup group to see more details of when it’s going to happen. Slightly more speculatively, the Cambridge University Computing and Technology Society have organised a 24-hour in-person puzzle hunt in Cambridge for each of the last five years, and while nothing appears to have been announced yet, I would bet small money that the next one will happen on Friday 16th June running into Saturday 17th June – i.e., the last day of Full Term – and that the site’s Facebook page would be the best place to look for an announcement. The Manorcon board games convention takes place at one of the halls of the University of Leicester, and for each of the last sixteen years, there has been a puzzly Treasure Hunt on each of the Sunday afternoons. Before all those, there’s dear old Puzzled Pint in London – and now also in Manchester! – on the second Tuesday of each month, also known as “tomorrow”. The puzzles here come from a rather more DASH-like background, but are deliberately accessible to all and designed to provide an hour or two’s fun for a team enjoying food, drink and good company. It’s not clear when the next big online puzzle hunt is going to be, for the Melbourne University Maths and Statistics Society‘s event that normally takes place around this time of year isn’t happening in 2017, and the Puzzle Hunt Calendar doesn’t really have much either. On the other hand, if you like logic puzzle contests then the calendar looks busy. The World Puzzle Federation’s Grand Prix season’s contests take place every four weeks, with the next starting on Friday 19th May. The next contest is set by the US authors, who ran an event with a loose escape room theme last year. 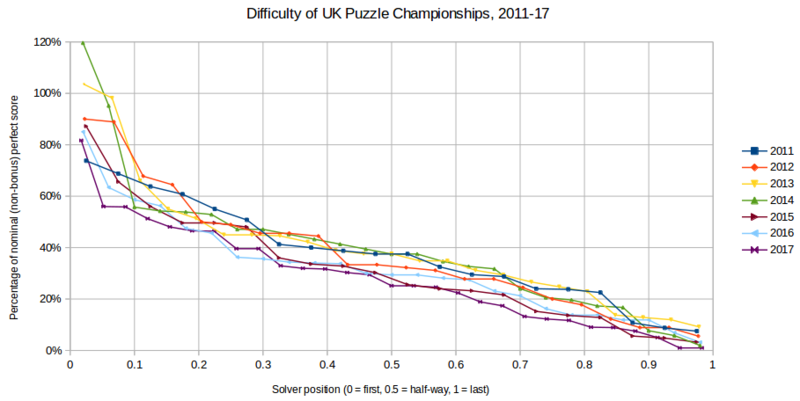 That’s not all from US authors, though; the US Puzzle Championship will be on Saturday 17th June. Look out (perhaps at @ukpuzzles on Twitter?) 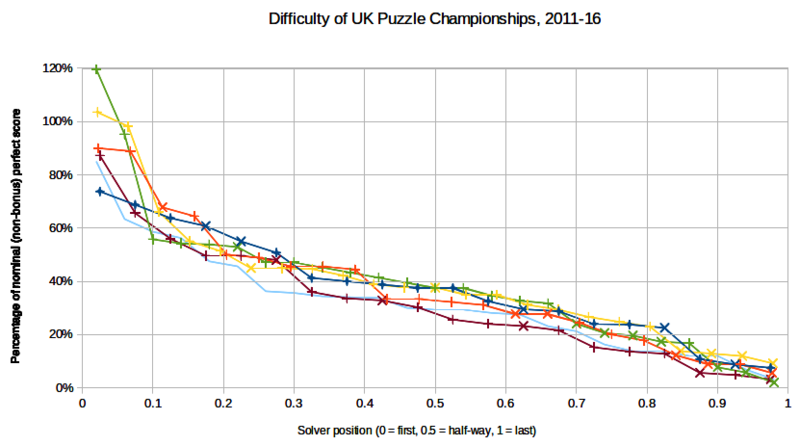 for news of the UK Puzzle Championship as well, with the last two having been in late June; if DASH is my in-person highlight of the year, the UKPC is my online contest highlight, so I’m really looking forward to it! 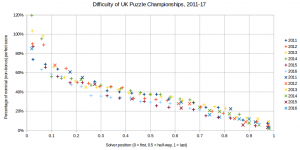 This is a post I’ve been working on in the background, on and off, for a while; every time we discuss competitions, especially international championships, it comes back to mind. The direct answer to the question is that it would seem vanishingly unlikely to ever get puzzles at the Olympic Games before other mind sports: games like chess, bridge, go and so on. It’s a subject that has been raised in the past by these mind sports’ governing bodies, but there has never been substantial progress on this front. (The highest-profile examples of mind sports at a festival of otherwise physical sports that I can find is that chess has had a couple of appearances at the Asian Games and the Universiade.) So let’s focus on the “…or something like it” instead, where there may be more to consider than you think. 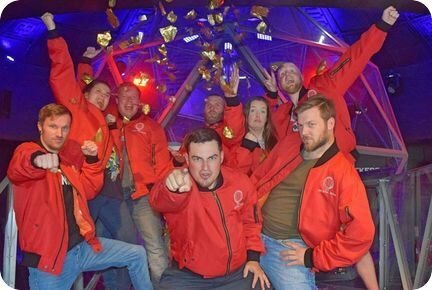 What would, could, should an escape game world championship look like? STOP PRESS! More DASH 9 London tickets are set to be released tomorrow! Immediately after the Red Bull Mind Gamers finals show was broadcast, some people declared the games played on the broadcast to be “not escape games”. Most of the most excitable responses were apparently made within Facebook groups. Manda Whitney, of the Room Escape Divas, forcefully and articulately made the (small-l) liberal case for the breadth of the term. I will say that the games played did seem to have rather more in common with some escape games than others. Although I haven’t played it, I would draw comparisons in format to the global Adventure Rooms company’s Original Swiss rooms, and I’ve heard other people draw slightly more distant comparisons to Time Run‘s new The Celestial Chain. 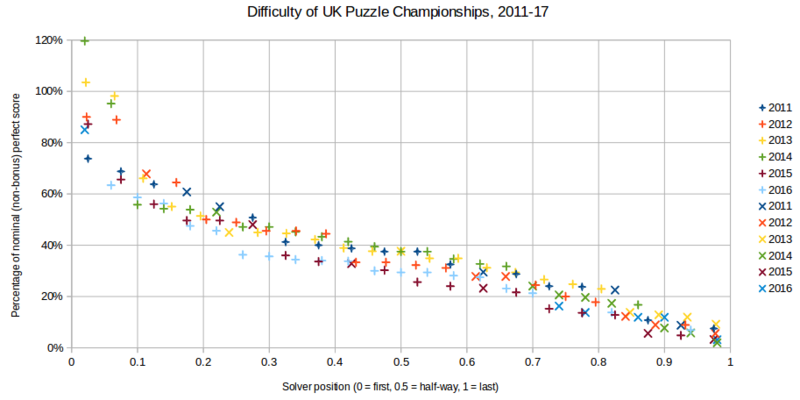 It’s probably also fair to say that the games in the final do not nearly fall in the centre of the set of games which are felt to have the escape game nature, and I don’t mind that in the least. The impression I get is that the game was designed first and foremost as a standalone Red Bull Mind Gamers experience, and had the description of “escape room world championship” appended to it rather later. It was a competition that declared a champion, so I’m happy with the “championship” part, and it had notably decent global representation for a first try, so calling it a “world championship” is not at all unreasonable. It tested skills that could entirely reasonably be tested when playing an escape room, so I’m happy to see the words “escape room” in there. Put them all together, and do you get “escape room world championship”? Well, I can see why people feel not. While the games at Red Bull Mind Gamers (hereafter RBMG) final was a competition testing skills that are called upon in escape rooms, it was also a competition not testing other skills that are tested in many, maybe even most, escape rooms. (Searching and prioritisation/sequencing of multiple solution elements, to name just two.) 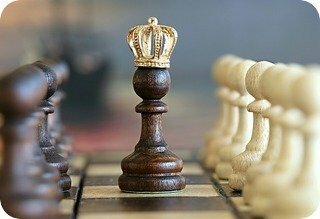 If you take the approach that an abstract escape room world championship “should” test skills relatively frequently found in relatively many escape rooms, implemented in ways similar to those found relatively frequently, you might well find it harder to get to “escape room world championship”. It seems quite possible that those complaining most strongly about the world championships adhere most strongly to those views. I say “let a thousand world championships bloom”! There is no governing body for escape rooms; as I said in passing last June, I’m very happy about this. The term escape room refers to an experience that is, joyously, so broad that the escape room championship experience can be just as broad. 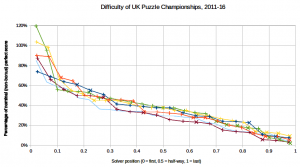 At one level, every single escape room that keeps a record of which team escaped most quickly holds its own championship; should a team from the UK go across to Vienna or Budapest and break those records, then they are international championships. Trying to work out which championship might be considered most prestigious is another matter entirely. A really interesting part of the joy and fascination of escape rooms is the way that surprise is, under most (? All? Almost all?) current implementations, part of the challenge. You don’t know what you’re going to face once you enter the room, and don’t know in advance what skills will be tested. In practice, most escape rooms will follow the good practice of somewhat trying to set players’ expectations in advance, to ensure that teams will be guided towards choosing to play the room that they will most enjoy. As much as there can be escape rooms that have a relatively high emphasis on physical aspects, or a relatively high emphasis on horror aspects, I would not invalidate a world championship that chose to place such emphases in their own rooms. (Compare with Boda Borg‘s “Quest Master” title for a team who completes all their challenges in a single visit, or the Autumn 2015 £1,000 competition held by the three-month pop-up Panic! room.) On the other hand, they would feel like championships of some subsection of the wider escape room experience at large… and quite probably that’s how Red Bull Mind Gamers feels, as well. Does playing in a world championship mean that participants need to be ready for anything that might come under the purview of the field in question? Suppose RBMG had heavily focused on horror elements, or even more heavily on physical elements, would that have been a problem? It’s tempting to look at the examples of courses in adventure races, which might test (from Wikipedia) “a range of disciplines including navigation, trekking, mountain biking, paddling and climbing”. Imagine that an adventure race choose to throw in, say, a tightrope walk, or a race through a cave. Would that deviate from the core adventure race experience? (This has happened in practice, as recently as last year.) Setting expectations in advance, and suggesting what skills may be tested, may well make for a player-friendly experience. If it’s intended that picking an ideal team for the test is part of the skill set to be tested, which seems reasonable, then let people know in advance if their self-selected team needs to include the fit, or the brave, or those with perfect colour vision, or the able-bodied at large. It’s hard to know what’s on the record and what’s not, but specifically taking Red Bull Mind Gamers into account, I am inclined to give the very strong benefit of the doubt to Dr. Scott Nicholson, who was one of the principals on the creative team, but not nearly as personally responsible for the design, implementation and particulars of game organisation as the show implied. I get the impression that he included a very great deal of original, imaginative, thoughtful and player-friendly practice in his design that was not brought to life in the product that made it to the TV show. He also included a great deal of practical science, as befits the association with a science fiction movie, in the gameplay that fell along the wayside. His intentions, and the results of his tests and designs with his students, came up against the practicalities of what might be realised and what Red Bull thought might make for good TV and the results of this multi-way clash were… variable. I get the impression that he designed for a Red Bull Mind Gamers event first and foremost, rather than for a straight-down-the-middle escape room world championship; I’m not sure if he would have designed things the same way if he had been told to prioritise the world championship nature more highly and the movie association less highly. That’s fair enough. Crucially, I don’t know if Red Bull would have funded a relatively conventional escape room world championship without a link to a media property of theirs. Going back several paragraphs, I come down on the side of concluding that these design decisions make the event no less credible or valuable a world championship. I don’t agree with all Scott’s design decisions. I’ll quote Scott as saying “In Escape Rooms, knowing when you are in over your head and need to get assistance is an important part of the play.” This is generally a wise, player-friendly policy, appropriate in 99% of cases. I would be inclined to say that world championships are among the 1% of cases that are an exception to that general principle and would have preferred a different treatment of the hint process in the semi-final. It’s tempting to wonder what other approaches might work; the only explicitly competitive one I am aware of to compare against is Escape Run in Malaysia in 2014, held by the chain known here as Escape Room UK, as described at Enigmatic Escape. 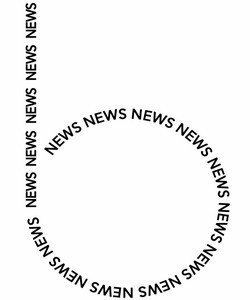 There wasn’t a media property to associate with; the business case for the event is that all the participants were drawn from branches of one particular business. I find it relatively easy to imagine a single chain with wide international visibility, like Escape Hunt or Adventure Rooms to name just two, hosting a championship to raise visibility of their own brand. All the assumptions I’ve made in this post are easily capable of being played with, but this is long enough as it is. Another post to follow – possibly the next, possibly not – is one I half-finished months ago playing with one of the biggest assumptions of them all. Summer 2016: where are the gaps in the UK market? From the National Archives; contains public sector information licensed under the Open Government Licence v3.0. In case anyone’s in any doubt, I’m absolutely thrilled with the job that Ken is doing with Exit Games UK since I handed it over to him. He’s definitely doing a better job of it than I could right now and may very well do a better job of it than I could do at my best. Certainly some of the changes he’s made to the administration of it are very smart, far better than I knew how to do. I’m thrilled that he’s brought the map up to date and also done a wonderful job revamping and improving the list of games, after a point at which I waved the white flag. His articles have also been top-notch, too. All that and it’s not even his first site! It’s possible that some of the first exit game room proprietors might have started business in the closest big city to where they happened to already live. However, if you had a choice as to where to set up business, where are the most obvious gaps in the market? Alternatively, where might people expect to see exit rooms coming soon? In mid-2016, now that some of the most successful operations have started two or more locations in different towns, where remains up for grabs? The Brookings Institution analysed 300 of the largest metropolitan economies in late 2012 and identified 15 of them as being in the UK. Because it’s the same list I’ve been using previously, here are the 15 largest metropolitan economies in the UK, alongside the number of exit rooms featured in each one. If there’s a large metropolitan economy without an exit room, there’s arguably a gap in the market there. You can find details of which sites are in which locations on the Exit Game details page. For comparison, the Dublin metro area with 3 sites open would come just below number three in the above list. So where are the gaps in the market? Er, there aren’t really any, any more. Too late! OK, that’s unduly flippant. I’ve linked to this before, even recently, but I really like Puzzle Break‘s Nate Martin’s take on competition between escape rooms. Let’s use a different list, along the same lines: list of UK cities by their Gross Value Added. A more recently updated version of the data is available from the ONS, but that breaks it down almost too much. That list on Wikipedia does display some editorial judgment by amalgamating some sections together, but does so in what I consider to be a helpful fashion. Don’t read too much into the ordering as there’s a great deal of “well, it depends on what you count” – how great (for instance) Greater Manchester might be, and so on. 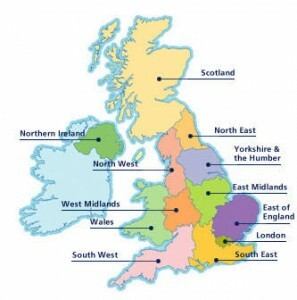 Is it wrong to count Leeds and Bradford as distinct? How about Coventry and Nuneaton? How about Newcastle and Whitley Bay? How about Manchester, Altrincham and Bury? …and so on. Very roughly, this points to West Yorkshire and the West Midlands being underserved. Bradford is definitely a pretty plausible-seeming place, Wakefield somehow less so. Coventry and Wolverhampton have potential and Birmingham still has room to grow. Southampton and Hull look very plausible. The Home Counties still also look promising: moderately-sized mid-distance commuter towns like Reading, Watford, Luton, Dartford, where getting into London (or up to Oxford or Milton Keynes, or down to the Guildford area) may still be annoyingly far. This site remains positive about seaside resorts: Margate, Whitby (or Scarborough), Great Yarmouth and so on. I would say that I was much more cautious about the market than I was last year, but the number of sites continuing to open just goes to show how little I really know!